. . .e end of all this is that maddening horror of unreality which descends upon the decadents, and compared with which physical pain itself would have the freshness of a youthful thing. The one hell which imagination must conceive as most hellish is to be eternally acting a play without even the narrowest and dirtiest greenroom in which to be human. And this is the condition of the decadent, of the aesthete, of the free-lover. To be everlastingly passing through dangers which we know cannot scathe us, to be taking oaths which we know cannot bind us, to be defying enemies who we know cannot conquer us—this is the grinning tyranny of decadence which is called freedom. An amusing collection of essays, all of which are entitled "A Defence of something". Indeed the introduction is "In Defense of a New Edition." All sorts of topics. Penny dreadfuls, skeletons, baby-worship, china shepherdesses. . . . I have such a crush of G. K. In this collection, he sets out to find the "diamonds in the dustheap"--all the good in the things that we think are silly, or sentimental, or useless (babyworship, for example, or idealistic pastoral). He is awfully clever. I love optimism. Not one of his best, but it is always enjoyable to read Chesterton. His observational skills partnered with his wit and skill in purveying his observations is unsurpassed. G.K. Chesterton in defence of all sorts of things and, as usual, laying it down. Che c'è da dire? 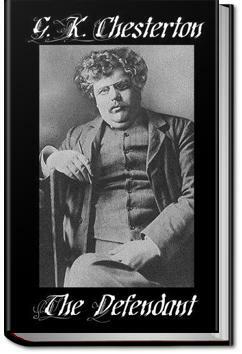 E' Chesterton. Ogni parola, ogni virgola, sono oro puro. Questa è una raccoltina minore e deliziosa.